An accident involving three vehicles on Highway 101 near Mountain View in California lead to the full closure of all lanes during morning rush hour this Friday. 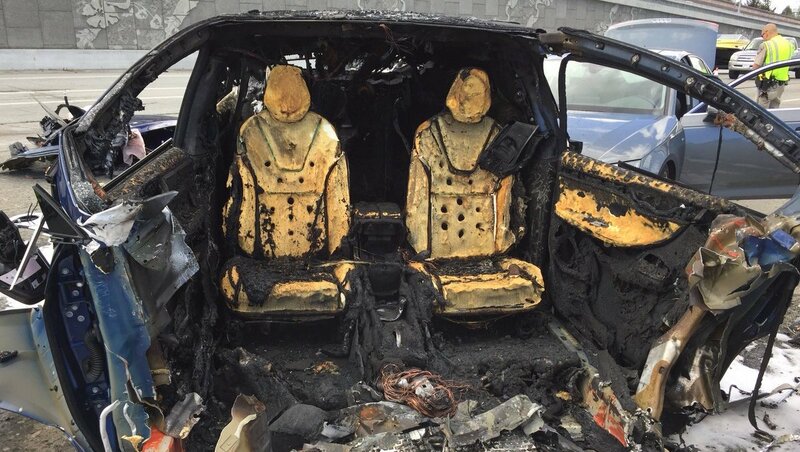 A Tesla Model X hit a concrete barrier separating the lanes, two more cars hit the Tesla, and the car’s battery started burning. The Tesla-driver later died of his injuries in the hospital. Twitter-user Dean C. Smith posted pictures from the crash scene. Tesla-employees – the Fremont factory is only 20 minutes, the Tesla-headquarter only 15 minutes from the crash scene – helped the emergency responders to safely remove the batteries. While the rescue work several cells exploded in the battery pack. One Tesla has around 7,000 battery cells. Even with the fact that gasoline and Diesel fueled cars have five times more fires after a crash, battery fires pose special challenges for emergency responders. To extinguish a battery fire large amounts of water and thermal cameras to monitor the fire are required. Tesla has put out some guidelines for that. NBC posted some videos from the crash scene.